Slovak Lettuce Soup. © 2010 Barbara Rolek licensed to About.com, Inc. 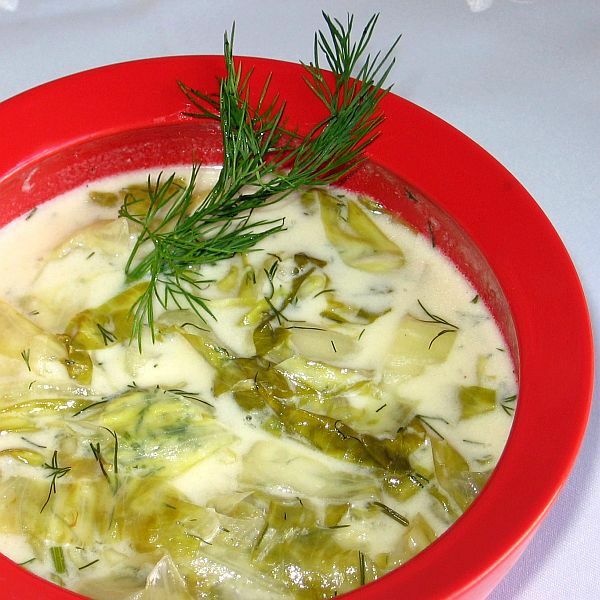 This fast-and-easy recipe for Slovak lettuce soup or šalátová polievka is adapted from one by Lubos Brieda. It can be made very simply for those times when meat cannot be eaten or fleshed out with the addition of bacon or sausage, hard-cooked eggs, and boiled potatoes. At the very least, I like to use chicken stock instead of water. The major components one shouldn't mess with, however, are the vinegar, sugar, and dill. They are what make lettuce soup what it is. This dish is a prime candidate for wilted, but not brown, lettuce. In a medium saucepan, make a roux by melting butter or bacon drippings with 4 tablespoons flour and cooking until flour is light brown. Stir in broth or water and bring to a boil. Whisk together 1 teaspoon flour with milk or milk-cream combination. Add to saucepan. Bring to a boil, reduce heat and simmer a few minutes. Add lettuce, sugar, vinegar, and dill. Bring to a boil and turn off heat. Adjust seasonings and serve in heated bowls with optional hard-cooked eggs, skinned and sliced smoked sausage, bacon bits, and mashed potatoes, if desired. The base for this lettuce soup is a combination of broth or water and milk and cream. But it is not thickened to the point of being a creamed soup. It is still quite thin. If it weren't for the lettuce, vinegar, and dill in this recipe, it could be considered an Eastern European milk soup of sorts. A true milk soup is always eaten hot either for breakfast or as an easily digested meal for the sick. They were a staple at Polish milk bars (bar mleczny) during the Communist era. Among farmers, milk soup was a means of using up cow's milk that couldn't be turned into cheese, butter or buttermilk because of time or manpower constraints. Today, it is a universal comfort food often served with noodles, bread, rice, barley, farina, millet or potatoes.